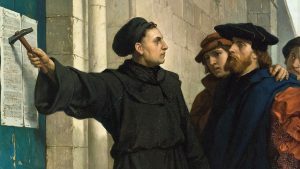 On this day 500 years ago, Martin Luther, an Augustinian friar in Wittenburg, Saxony nailed 95 Theses, or arguments, against the sale of indulgences to the door of Castle Church in Wittenburg. Indulgences were being sold in the area. The purchase of indulgences essentially granted sinners forgiveness of sins, freeing them from purgatory. Luther pressed the argument that salvation is free to all as a result of the sacrifice of Christ. Luther’s action, influenced by reformers John Wycliff and Jan Hus, created a Reformation movement that rapidly spread across Europe. This gave rise to Protestants, or those who protested against certain practices of the Catholic church. Luther wanted to reform the church, but created a separate religion, Lutheranism, when he found that to be impossible. Many other reformers rose up after this period, creating other main religions of today. Luther’s movement and others in the reformation emphasized the key essentials of Christianity: faith alone (soia fides), grace alone (sola gratia), Christ alone (solus Christus). Modern Protestantism is deeply in debt to the early church, Catholic and Orthodox, especially with regard to the teaching and writings of early church fathers which helped to develop the essential doctrines most Christian religions observe today. It’s all too easy to be impelled to throw the baby out with the bathwater. 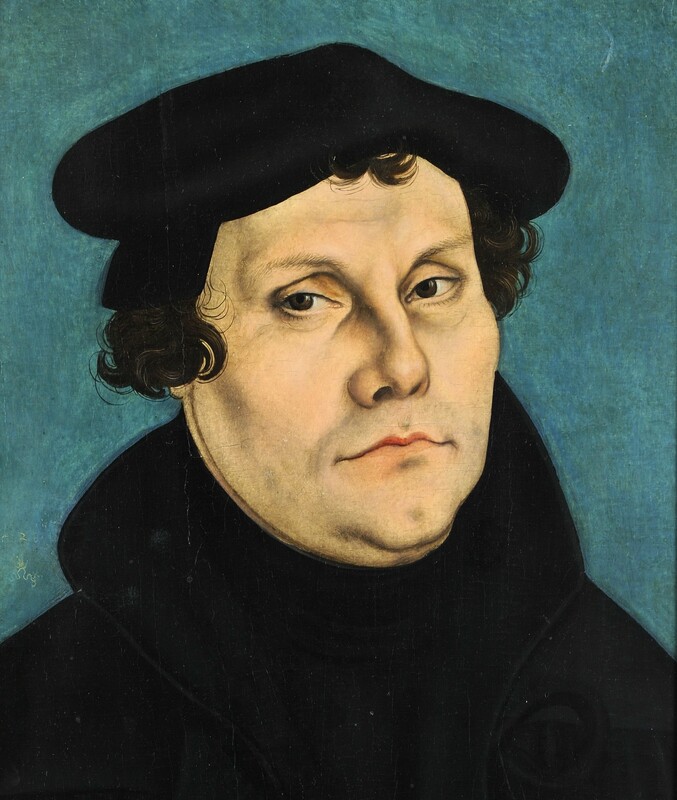 Luther first wanted to reform the Catholic church, but when that became impossible, he created a purer religion than was being observed at the time. A modern day heresy, the prosperity gospel, is being called out for the error that it is by too few. In my opinion, it is just as dangerous as the sale of indulgences was during the time of the reformers. My heart was warmed by the joint service between Catholics and Lutherans last Sunday at Our Lady of Guadalupe Co-Cathedral. I’m planning to share some of the aspects of that service in an upcoming column. The main takeaway was that Christians need to emphasize their unity rather than where they disagree. This entry was posted in Church Visits Blog and tagged Archbishop Etienne, Bishop Shelley Wickstrom, Catholic, Lutheran, Lutheranism, Martin Luther, Our Lady of Guadalupe, reformation on October 31, 2017 by Chris Thompson. 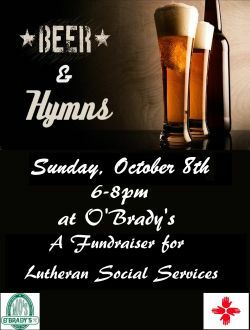 One of my favorite events, Beer and Hymns, is coming back, this Sunday, October 8. It benefits Lutheran Social Services of Alaska (LSSA). It’s held at Mo’s O’Brady’s Restaurant in the Carr’s Huffman Business Plaza. Google Map Things get rolling promptly at 6 p.m. so be sure to arrive early to grab a table and seat; they go fast! 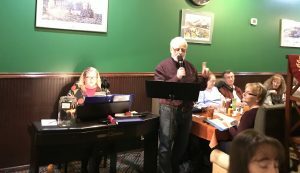 Pastor Dan Bollerud, retired pastor of Christ Our Savior Lutheran Church, leads the singing with his marvelous baritone voice. Jamie Berge, pianist extraordinaire, will tickle the ivories in a delightful manner. I hear John Klapproth will play along with guitar & harmonica. Attendees choose from over 60 hymns in a special hymnbook. It’s all about requests! Lutheran Social Services of Alaska provides a variety of services to Alaska families including a local food pantry. Alan Budahl, LSSA executive director will be on hand to answer questions regarding their activities, and accept your donation. No fees charged for this wonderful event, and attendees end up donating a respectable sum of money between 6 and 8 p.m. 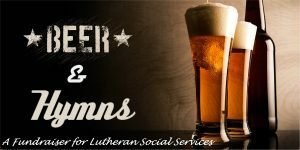 Recent Beer and Hymns events have seen $7,000-$10,000 donated during this brief time. I find it very interesting how singing praises opens the purse strings. Meeting new friends and greeting old friends is a key part of the charm of this worthy get-together. Pastor Dan usually asks for a roll call of the various churches represented. I’m continue to be amazed by the great diversity of faiths there. It’s common to hear Catholic, Episcopal, Pentecostal, Baptist, Lutheran, Methodist, and Presbyterian churches, to name a few, chiming in to register their faith community. If your heart needs an uplift, I urge you give this event a try. A few people are put off by the juxtaposition of beer and hymns., Martin Luther is famously quoted as saying, “It is better to think of church in the ale-house than to think of the ale-house in church.” Mo also has plenty of non-alcoholic beverages, and O’Brady’s tasty dinner entrees. I’ll be there and would love to meet you if you choose to come. This entry was posted in Church Visits Blog and tagged Alan Budahl, LSSA, Lutheran, Rev Dan Bollerud on October 3, 2017 by Chris Thompson.